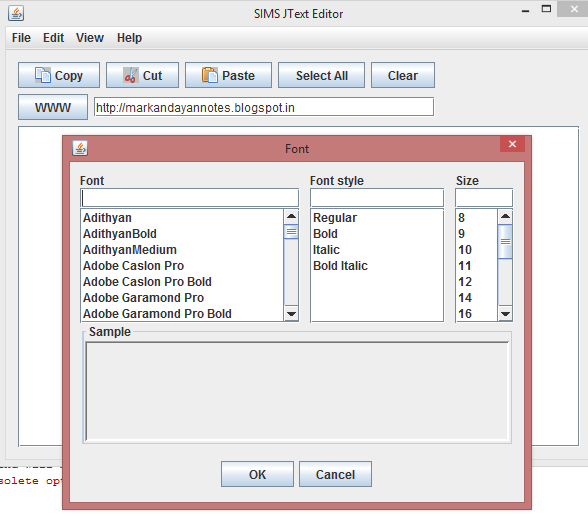 MARK JTEXT Editor is a basic text editor that you can use to create simple documents. 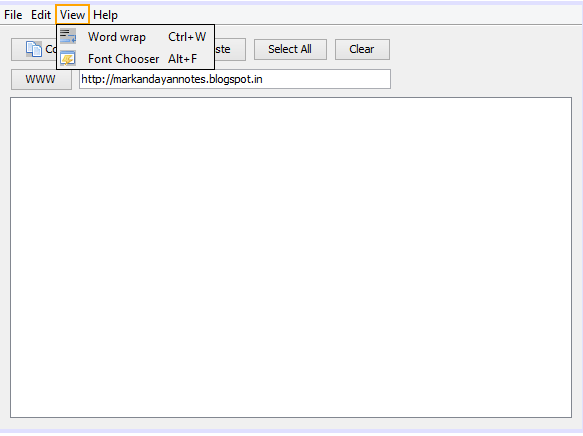 The most common use for MARK JTEXT Editor is to view or edit text files. It supports only very basic formatting; you cannot accidentally save special formatting in documents that need to remain pure text. This is especially useful when creating Java Programs, HTML documents for a Web page because special characters or other formatting may not appear in your published Web page or may even cause errors. You can save your MARK JTEXT Editor files as Unicode, ANSI, UTF-8, or big-endian Unicode. These formats provide you greater flexibility when working with documents that use different character sets. 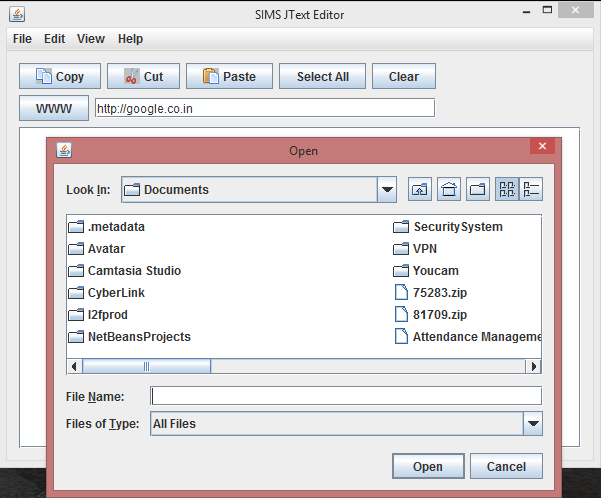 The MARK JTEXT Editor Application is a menu driven application that performs text editing operations such as File, Edit, earch and Help operations.The MARK JTEXT editor is customized for a specific use that can determine what the user is editing and assist the user, often by completing programming terms and showing tooltips with relevant documentation. Many text editors for software developers include source code syntax highlighting and automatic indentation to make programs easier to read and write. The MARK JTEXT editor lets the user select the name of an include file, function or variable, then jump to its definition. Some also allow for easy navigation back to the original section of code by storing the initial cursor location or by displaying the requested definition in a popup window or temporary buffer. Some editors implement this ability themselves, but often an auxiliary utility like ctags is used to locate the definitions. The existing system has many drawbacks like maintaining records for all Clients, online transactions is not possible, and manpower is required. It is more difficult by verifying all the information and making reports for each and every transactions ,up and down time details and the final reports which are going to be stored to their transaction have to be kept secure and also generation of every report is very difficult. The present system is a manual work and is should require so much of manpower and it is very time consuming process. Information related to all transactions is stored in different tables. Since all the values are stored in different tables, it takes a lot of time to prepare different reports and know the information about that particular transaction. Complication and duplication in manual work, thus it causes redundancy. Since data is compiled at different types of transactions. If the data is more validation becomes difficult. This may result in loss of accuracy. Various reports are tabulated manually. They are not much attractive and require more time. Online enquiry of data is not possible. · To reduce paper work. · To save time by getting faster results. · The reports needed by the officials for analysis and decision making will be readily available. · To avoid errors inherent in manual paper work . · and finally retrieve this information as efficiently as possible. · To provide tangible as well as intangible cost saving . The proposed system scope is stand alone. We are using this system in a single pc. In future it can be enhanced to be a global communication medium. The system “ MARK JTEXT Editor “ consists of 4 modules. · Reading text files: Open any text file and view its contents. · Find: Finding a given word in a text file. · It displays metadata of a file which is not available in notepad. · It can be used to type programs also. The project is based on “Text Editor”. This project is carried out at Netmax Technologies. This software firm deals in developing software for its clients. Text Editor: - A text editor is a type of program used for editing plain text files.A plain text file is represented and edited by showing all the characters as they are present in the file. The only characters usable for 'mark-up' are the control characters of the used character set; in practice this is newline, tab and form feed. The most commonly used character set is ASCII, especially recently, as plain text files are more often being used for programming and configuration, and less frequently for documentation (e.g. detailed instructions, user guides) than in the past. 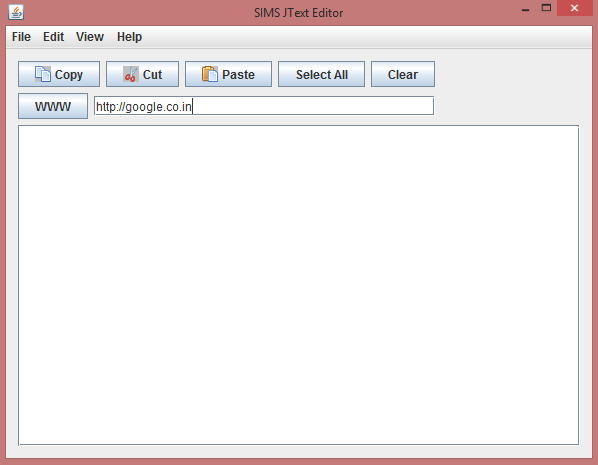 Our text editor provides basic features of an editor. · String searching ­- search string with by typing it in search string. 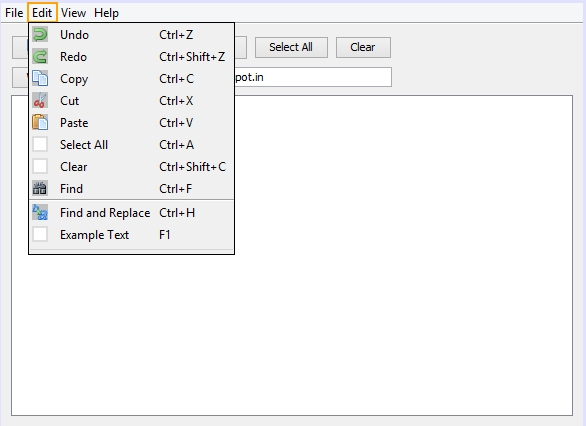 · Cut, copy, and paste - most text editors provide methods to duplicate and move text within the file, or between files. · Multiple font colors – The editor provides 4 different font colors to make a text more interactive and attractive. · Fonts – the editor provides all fonts that can be used to make a text more appealing. · Dock- the editor provides a very interactive graphical user interface in which there is a dock. The dock consist those options which are in frequent use for e.g. cut, copy, paste etc. This is also known as Classic Life Cycle Model (or) Linear Sequential Model (or) Waterfall Method. This has the following activities. As software is always of a large system (or business), work begins by establishing requirements for all system elements and then allocating some subset of these requirements to software. This system view is essential when software must interface with other elements such as hardware, people and other resources. System is the basic and very critical requirement for the existence of software in any entity. So if the system is not in place, the system should be engineered and put in place. In some cases, to extract the maximum output, the system should be re-engineered and spruced up. Once the ideal system is engineered or tuned, the development team studies the software requirement for the system. This is also known as feasibility study. In this phase, the development team visits the customer and studies their system. They investigate the need for possible software automation in the given system. By the end of the feasibility study, the team furnishes a document that holds the different specific recommendations for the candidate system. It also includes the personnel assignments, costs, project schedule, and target dates. The requirements gathering process is intensified and focused specially on software. To understand the nature of the program(s) to be built, the system engineer ("analyst") must understand the information domain for the software, as well as required function, behavior, performance and interfacing. The essential purpose of this phase is to find the need and to define the problem that needs to be solved. In this phase, the software development process, the software's overall structure and its nuances are defined. In terms of the client/server technology, the number of tiers needed for the package architecture, the database design, the data structure design etc are all defined in this phase. A software development model is created. Analysis and Design are very crucial in the whole development cycle. Any glitch in the design phase could be very expensive to solve in the later stage of the software development. Much care is taken during this phase. The logical system of the product is developed in this phase. Once the code is generated, the software program testing begins. Different testing methodologies are available to unravel the bugs that were committed during the previous phases. Different testing tools and methodologies are already available. Some companies build their own testing tools that are tailor made for their own development operations. Software will definitely undergo change once it is delivered to the customer. There are many reasons for the change. Change could happen because of some unexpected input values into the system. In addition, the changes in the system could directly affect the software operations. The software should be developed to accommodate changes that could happen during the post implementation period.